Engineered Wood Flooring is another option to consider. Not only is it available in a variety of finishes and styles, it is also available in different structures. As such, it is easy to achieve the look you want without having to sacrifice quality. Reduces the number of trees that have to used to manufacture the flooring. Eliminates problems with expanding and contracting, which are typical problems with other types of hardwood flooring. Can be used with under-floor heating. Can be placed on uneven surfaces. Can be used in areas that are exposed to high amounts of moisture, including bathrooms and kitchens. Sandwich board, in which the entire board is made from the same tree species. Poplar back, in which the board is made of two layers of poplar. Top-quality engineered flooring looks just like solid wood. You will get the pure beauty of solid wood, with all of the benefits of engineered flooring. Our engineered flooring adopts German coating technologies. 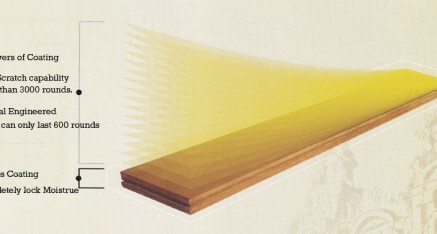 Unlike normal engineered flooring which uses from 6-12 layers of coating, Hong Ye Engineered Flooring uses 16 layers. This ensures that our product is able to withstand the toughest environments. With all of the outstanding 16 layers of coating, your flooring will look absolutely gorgeous and super long lasting! Engineered hardwood flooring is a product made up of a core of hardwood, plywood or HDF and a top layer of hardwood veneer that is glued on the top surface of the core and is available in almost any hardwood species. The product thus has the natural characteristics of the selected wood species as opposed to a photographic layer. The “engineered” product has been designed to provide greater stability, particularly where moisture or heat pose problems for solid hardwood floors. How many layers does engineered flooring have? Does engineering destroy the natural beauty of hardwood floors? Not at all. The top hardwood layer is the same genuine hardwood you have in solid hardwood floors. This “show” veneer is available in most species of natural hardwood. What is the thickness of the hardwood veneer? The hardwood veneer, or top layer of hardwood, can typically be 0.6mm to 4.5mm or more in thickness. A quality hardwood veneer will provide many years of wear. Hong Ye Engineered Hard wood with 2mm or 4mm hardwood veneer comes with 25 years of warranty. Can I refinish an engineered floor? It depends upon the thickness of your hardwood layer but the fact is that 95 % of hardwood surfaces are never refinished. With the high quality finishes that are offered and the extensive process that refinishing a floor entails, damaged areas are often removed professionally. If sanding is desired, typically, the professional sanding procedure removes 1/32 of an inch. Thus if your floor has a 2mm layer you can sand the floor 1-2 times. But with German high quality coating, Hong Ye Engineered Hardwood does not really need to be refinished. Do I need to hire a contractor to install for me? No, you don’t have to, unless you request to use your own contractor. Hong Ye Eco Technologies provides hassel free service, and we will help you install. Who can order from Hong Ye Eco Technologies? We welcome all potential customers to send us inquiries. Either an individual customer or a corporate customer. You can just simply send us an email or give us a call. Our consultants will get in touch with you shortly. Copyright © 2016 Hong Ye Eco Technologies Pte Ltd. All rights reserved.